Acutelearn reserves the right to cancel or reschedule courses with prior notice without any liability on its part. Course material will be shared after receiving the entire fees. Lab will be shared after receiving the entire fees. We work from 6:00 AM IST to 10:00 PM IST from Mon to Sat. Once admission taken and if you are unable to continue in the current batch, you will be given permission to attend the next batch when scheduled, Student should be able to attend the batch and complete the course within the 3 month's time from the date of admission. If you are attending classes in regular track, if you are not satisfied with the faculty teaching, you should intimate us before the 4th class, we will try to arrange classes with another faculty based on availability, if failed to arrange the classes the fees will be refunded. Once completion of 4th class the fees will not be refunded. If you are attending classes in fast track, if you are not satisfied with the faculty teaching, you should intimate us In 1st class itself, we will try to arrange classes with another faculty based on availability, once completion of 2nd class the fees will not be refunded. Labs are accessible 24/7 , the servers will get powered off automatically after 2 hrs of idle time, Student has permissions to power on the machines. 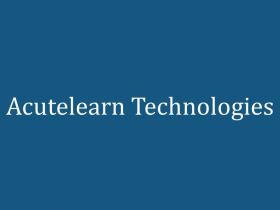 In case of any issues in accessing lab or powering on servers, you can mail to labsupport@acutelearn.com and you can reach on +917702999361/ +917702999371 during the work hrs. In case if you are drop from the batch In the middle of the course the money will not be refund.